Green Book Exhibit 3-1 "Stopping Sight Distance"
Green Book Exhibit 3-2 "Stopping Sight Distance on Grades"
The practical capacity of each lane of a signal controlled approach is 1000 passenger cars per hour of green time per 10 ft. of travelway width where conflicts with parking, turning movements, commercial vehicles, and pedestrians are at a minimum, and where vehicles are not required to wait more than one complete cycle for the right of way. This capacity is reduced one percent for each one percent of commercial vehicles and uncontrolled left turning movements, and one half of one percent for each one percent of right turning vehicles. The average time spacing for moving vehicles at signalized intersections is 2.1 seconds. The maximum traffic volume that can turn left or right from a 10 ft. wide auxiliary lane in a 30-second phase with ten percent commercial vehicles present is 450 vph for a 60-second time cycle, 300 vph for a 90-second time cycle, and 225 vph for a 120-second time cycle. A two-lane approach for high volume turns will increase these capacities by about 50 percent. Turning movement phases longer than 30 seconds, except at Tee intersections, are not practical and are not used for design purposes. The foregoing volumes for turning vehicles are only used as a guide. A more detailed capacity analysis must be made as outlined in the Highway Capacity Manual, to determine the exact needs and requirements for a signalized intersection. These lanes are provided on the major roadway and are encouraged on the minor roadway where possible to allow turning vehicles to slow and be stored out of the through traffic lanes. It is desirable to provide them since they tend to reduce accidents, improve intersection capacity, and allow for the most efficient methods of controlling traffic. Often, auxiliary lanes can be added by utilizing existing shoulders. Consult the Access Management Guidelines for additional auxiliary lane information. Left-turn lanes are considered on roadways where traffic volumes are high enough or safety considerations are sufficient to warrant them. Access Management Guidelines are used to determine if left-turn lanes are warranted. Where the peak hour left-turning traffic exceeds 300 vph, dual left-turn lanes are considered. If the peak hour left-turning traffic exceeds 600 vph, a three lane left-turn facility is considered. When dual or triple left-turn lanes are used they must have adequate receiving lanes. Tapered lanes are not appropriate. Left-turn lanes may also be considered at intersections where traffic volumes do not warrant them but are required because of poor visibility or accident records indicate a need. Left-turn lanes are at least 10 ft. wide with additional width provided for striping of flush medians or for curb clearances of barrier curbs for raised medians. Left-turn lanes for 30 or 40 mph operating speeds are developed according to certain minimum design criteria (i.e., width transitions and deceleration length) and are constructed using barrier curbs. They are lighted by direct reflectance to the extent necessary to illuminate the ends. Left-turn lanes for 50 or 60 mph operating speeds are developed according to different design criteria (i.e., width transitions and deceleration length). Left-turn lanes developed from continuous medians are constructed with barrier curbs for at least the length of the left-turn storage with the barrier end lighted by direct reflectance. Additional information concerning storage length is discussed later in this article. The use of a divisional island at an intersection to separate the left turning traffic from same direction through traffic may be desirable, particularly where opposing traffic is separated by a wide median. This island will make a left turn from an auxiliary left turn lane mandatory and requires lane control signing. At an intersection with multiple left-turn lanes, two or three vehicles will be simultaneously making left turns. Therefore, the number of receiving lanes on the downstream roadway will be the same as the number of left-turning lanes. Sometimes at an intersection with multiple left-turn lanes, the number of receiving lanes on the downstream roadway may be one less. In this situation, a multiple left turn may be installed by including a transition section on the receiving roadway, essentially creating a merging section with a lane-drop condition at another location downstream. The distance measured from the beginning of the departing roadway to the beginning of the lane-drop location, excluding the lane-drop taper section, is known as the Merging Section Length. This length must be sufficiently long to avoid any delay to the left turning and through vehicles on the approach. When this length is insufficient, vehicles traveling on the lane being dropped will be forced to slow, stop or perform an unsafe maneuver. This results in undesirable traffic operations and safety problems, caused by queues overflowing into the intersection. A microsimulation analysis, using the VISSIM software package, is performed to determine the appropriate downstream lane-drop distance to avoid disruption of traffic. The location and turning movement information of any driveways located in the Merging Section (including a driveway that is the destination of the lane-drop). The analysis will also compare delay for left turning vehicles in the Merging Section for varying Merging Section lengths. The length that produces the optimum delay is selected. Warrants for right turn lanes are determined by the Access Management Guidelines. To prevent through vehicles from being falsely led into the auxiliary right turn lane, an abrupt taper is used at the beginning of the lane. At locations where it is impractical or not warranted to provide an auxiliary right turn lane, a channelizing island will reduce right turning maneuver conflicts with through traffic. However, a few straight through vehicles stopped in the right lane waiting for a gap in traffic will block the right turn movement. Conversely, a few right turning vehicles stopped while waiting for a gap in the cross street traffic will block the right lane for through vehicle storage. The length of a full width auxiliary lane consists of a deceleration length plus a storage length. Storage length is determined on the basis of the maximum possible total time cycle, peak hour traffic volume, and average storage length required per vehicle. The required storage length for use in design is 1.5 times the calculated exact storage for major streets and 2.0 times the calculated exact storage for freeway off-ramps. As a guide a 50 ft. minimum storage length is desirable. The calculated required length may be varied, when necessary, to provide a practical design consistent with capacity limiting features of the street approaches beyond the limits of the proposed improvement or with the unavoidable conflicts with other traffic movements on the same approach. Deceleration distances include minimum and desirable lengths and are provided where practical. The desirable deceleration length represents the length required for a driver to react to a forming queue at an upcoming intersection and apply the brake coming to a stop behind the forming queue. This is a conservative approach. The minimum deceleration length represents only the braking distance required to come to a stop with a more aggressive deceleration rate. This is the less conservative approach. Exhibit 3-1 of the AASHTO Green Book can be consulted for specific deceleration rates while Exhibit 3-2 can be consulted (to determine increases in deceleration lengths due to grades) for roadway grades equal to or exceeding 3%. Islands are triangular or longitudinal. Triangular islands are generally used on the minor approach to an at-grade intersection, crossovers for major side roads, state routes and major streets, and on ramp terminals at the crossroad or streets at interchanges. Islands at ramp termini are placed in accordance with alignment controls of diamond interchanges. Islands for at-grade intersections are placed in accordance with Standard Plan 203.65. Islands when required at crossovers are placed in accordance with the standard plans. Where the highway shoulder is carried through the intersection, the island is placed at the edge of the shoulder. The side of a longitudinal island adjacent to through-traffic lanes is offset from the edge of the traveled way by at least 2 ft. The island may be offset a greater distance if necessary or desirable to eliminate a particular hazard. all islands established for the purpose of locating traffic signal poles or lighting poles. reducing large paved areas at intersections. In cases where it is apparent that traffic signals will be installed within a reasonable period of time after construction at the intersection or interchange, divisional islands will be designed and lighted with the initial construction. Additional information about islands is given in Chapter 9 of the AASHTO Green Book. Minimum design vehicle turning radii are shown in the following table. These radii are satisfactory as minimum design where turning speeds of 10 mph or less are appropriate at intersections. The radii for turning movements at urban street intersections can be less where the extra pavement width serves to increase the useable radius. When curbs are used, it is desirable to use flatter curves than those in the minimum edge of traveled way designs. The WB-67 (WB-20) is used as the design vehicle for geometric radii for ramp terminals on the interstate and primary system, as well as for adjacent outer roads and entrances where it is anticipated this vehicle will operate. This design vehicle is the maximum semitrailer (53 ft. trailer length) able to legally operate in Missouri. Yielding right turn lane. When a departure auxiliary lane is not present, a yielding right turn lane can be used. The yielding right turn design provides a turning vehicle alignment with an improved field of view of approaching traffic. The improved visibility allows improved judgment of gaps in the cross-street traffic with a lower incidence of rear end collisions. Merging right turn lane. When a departure auxiliary us present, a merging right turn lane is used. The merging right turn design provides a simple radius curve tangent to two intersecting roadways. The volume of turning traffic and the type of vehicles to be accommodated on the roadway control travelway widths. Where lane widths of channelized right turn lanes exceed 20 ft. in width, lane delineation with painted lane markings are appropriate to restrict the turning movement operation to one lane use. Vehicles with wider offtracking wheel paths can still use the extra paved width to negotiate the turn. Templates from the Design Division or Chapter 3 of the AASHTO Green Book can determine required roadway widths for vehicle offtracking. An additional 1 ft. clearance outside the maximum wheel offtracking along each side is provided for the turning roadway width. 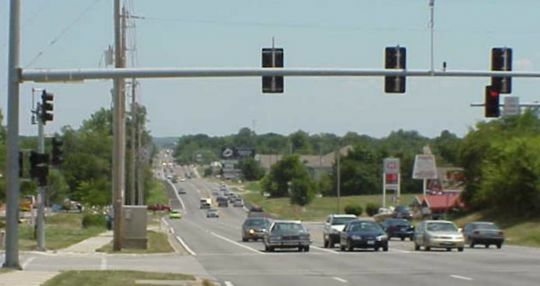 At signal controlled intersections where existing street widths determine the lane use for various traffic movements, lane widths 10 to 13 ft. are used, with widths of 11 to 13 ft. desirable for safety and efficiency of operation. Off-ramps into signalized intersections are a minimum of 24 ft. in width at the intersection when construction peak hour volume is 60 vph or greater, or the design peak hour volume is 90 vph or greater. This allows the traffic to be separately channeled, stored, and controlled for the right and left turning movements. The storage length required for the heavier of these movements determines the total length of the 24 ft. travelway. While the above comments are helpful in the basic design of a signal control intersection, much more is necessary to ensure signals, signs, lighting and pavement marking provided are appropriate to operate the intersection to capacity. Specific criteria for these activities are contained in the Traffic Control articles found in this Guide. This information is found in the Lighting, Signals, and Signing articles. This page was last modified on 26 October 2018, at 07:58.